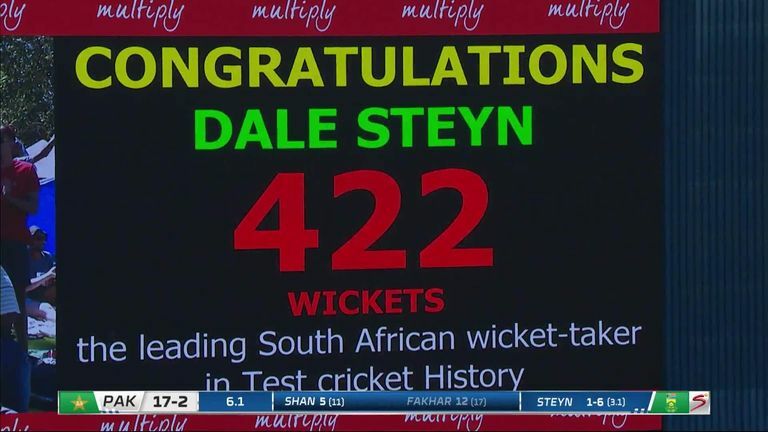 Dale Steyn becomes South Africa's leading Test wicket-taker after claiming his 422nd scalp against Pakistan at Centurion. Dale Steyn became South Africa's leading Test wicket-taker after claiming his 422nd scalp in the first Test against Pakistan in Centurion, as 15 wickets fell on day one. The 35-year-old overtook countryman Shaun Pollock when he found Fakhar Zaman's outside edge, with Dean Elgar taking a good catch in the slips, as his record-breaking moment was met with a standing ovation from the crowd. It was the only wicket the 35-year-old picked up during Pakistan's first innings as Duanne Olivier claimed his maiden Test five-wicket haul - bowling Shan Masood (19), Sarfraz Ahmed (0) and Mohammad Amir (1), trapping Asad Shafiq (7) lbw, and having Azhar Ali (36) caught in the slips as the tourists slumped to 96-7. The pick of the action from a 15-wicket day one at Centurion as Dale Steyn became South Africa's leading Test bowler. Babar Azam provided some resistance, reaching his half-century off 58, but fell for a well-made 71 to Kagiso Rabada with Pakistan bowled out for 181. South Africa slipped to 43-4 in their reply with Aiden Markram (12) dismissed lbw by Hasan Ali, the struggling Hashim Amla caught at gully for eight off Mohammad Amir while Dean Elgar and Faf du Plessis fell off consecutive balls from Shaheen Shah Afridi. Temba Bavuma (38 not out) and Steyn (13 not out) helped the Proteas to 127-5 at the close of play, leaving the hosts trailing by just 54 runs. Steyn reached his record-breaking milestone in his 89th Test match, 19 games quicker than Pollock, after a series of injuries restricted him to playing just seven red-ball matches for the Proteas in the last two years. Marcus Trescothick was the fast bowler's first Test victim when he was bowled by the then debutant in Port Elizabeth in December 2004 and he drew level with his former captain Pollock on 421 Test wickets in July 2018, when he had Sri Lanka's Lakshan Sandakan caught. The seamer is at No 11 on the list of all-time wicket-takers in Test cricket with New Zealand's Richard Hadlee ahead of him in 10th place on 431. 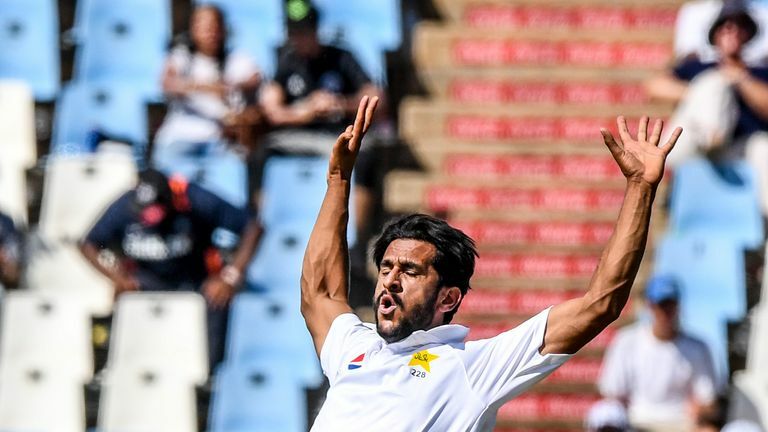 Watch day two of South Africa vs Pakistan in the first Test at Centurion live on Sky Sports Cricket from 7.55am on Thursday.